There is a lady who begs at a set of traffic lights on my bus route to work. She is elderly, and leans on a zimmer frame, and begs from the drivers of the passing cars. One day, I saw that someone had given her a 1000 peso note (worth about 35 pence or 55 US cents), and she crossed herself with it. All being well, I’m off to the Coast again today to visit the four pilot children’s clubs being set up by Vive Kids. Sunglasses, sunblock, insect repellent and my sun hat are all packed. I am just waiting to hear if I have to take my hammock. Like many cities round the world, Medellín is laid out on a grid system. The streets run east to west and the roads run north to south. Each street and each road is numbered. So your address is made up of the number of the street you live on, the number of the road it intersects with, and the number of metres it is to the intersection. The consequence is that it is almost impossible to get lost if you know the address of where you are going, and can keep your bearings about which way is north. Just to keep you from getting too comfortable, some of the main streets in the centre have names as well as numbers, so you have to learn those too. If you ever need to get off a bus in Medellín, here is some helpful advice. 1. Plan ahead. You might have to push pass about 20 people to get to the door. 2. Have your money in your hand to pay the driver as you get off. You don’t won’t to be rummaging in your bag for your purse. 3. Apologize quietly to everybody whose toe you stand on. 5. If someone is sitting on the step, tap them gently on the head to get their attention. 6. Don’t be offended if a complete stranger gives you his hand as you step off. I love my church. The people are warm and friendly, and are really interested in my work at Vive Kids. It is one of the oldest Protestant churches in Colombiaand is smack in the centre of town, reflecting an early mission strategy. The neighborhood has sunk from its former glory, and is now the red light district. I like the idea that there is a church there, a light in the darkness, which is what I tell the sceptical taxi drivers who take me there every Sunday. It’s the only church I ever attended where the scent of marihuana wafts through the windows. 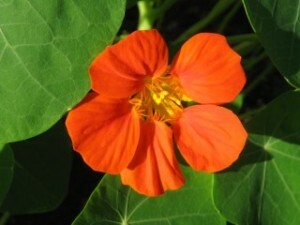 If you read my blog entry I started work, you’ll know that I was planning to plant nasturtiums. Well, the packet I bought only had six seeds, which seems a bit paltry. But anyway, imagine my delight this morning, to discover that three had germinated! My work is challenging, frustrating, perplexing, daunting, impossible. But sometimes I am filled with a strange and holy glee when I remember that I am getting to be part of something SO HUGE.